See Barbie. See Ken. 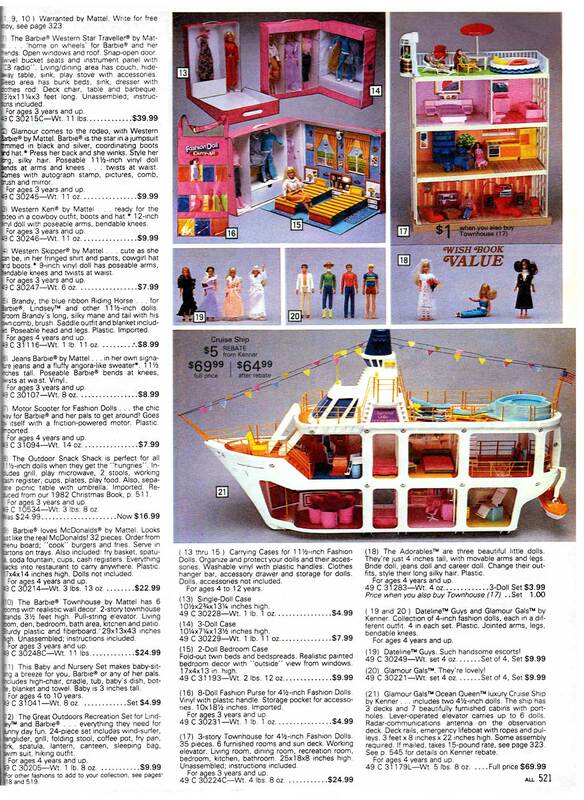 See Barbie’s Western Star Traveller RV. Drive, Barbie Drive. 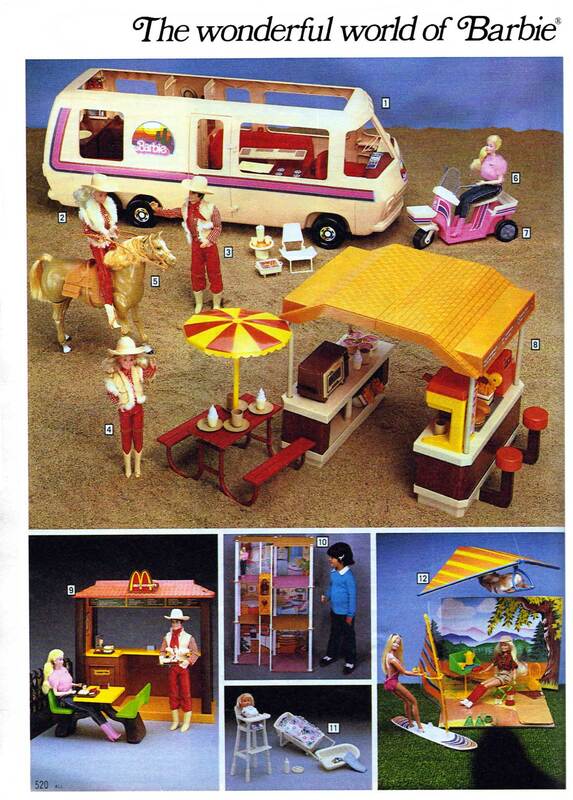 Drive to your Barbie McDonalds. Or to your townhouse. Or cruise ship. Welcome to Barbie’s world. Barbie is now nearing 60, but hardly looks a day over 21. 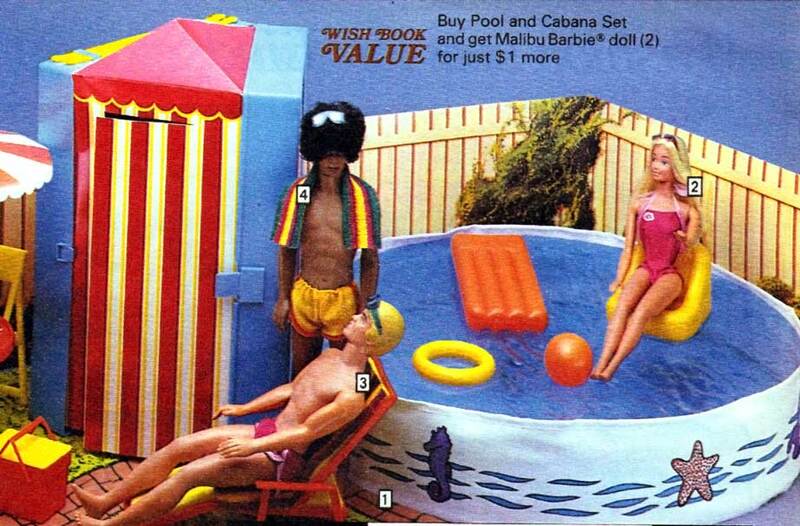 The 1983 Sears Wishbook devoted six pages to Barbie and similar dolls — Lovely Lindsey, P.J., Barbie’s boyfriend Ken of course, and “Black Ken” — who either has a sorry excuse for an Afro, or is into wearing vintage Russian headgear. Two pages of the six are all about clothes. The rest are all about lifestyles. Barbie seems to be continuing a fling with western-themed items that probably began when the “Urban Cowboy” movie was released a couple years before, but she also likes also disco and Jane Fonda-style workouts. Barbie’s a girl of many interests. She’s into hanging out with Western Ken at fast food joints. The 32 (easily lost) pieces of the Barbie McDonalds allow children to “order from the menu board, ‘cook’ burgers and fries, and even comes with a spatula! How much fun is that! Yeah, well, probably not as much fun as a weekend on the cruise ship or a night in Barbie’s townhouse — with or without Black Ken around. 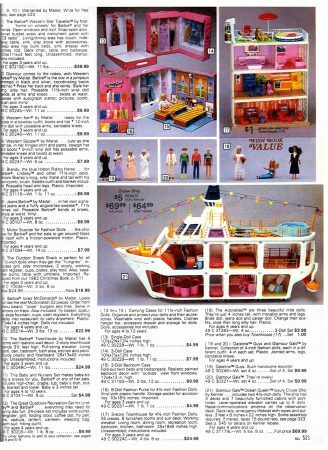 Next Next post: Where have “baby sleighs” gone?